Cancer killed fewer Europeans in the first half of this decade, largely thanks to a decrease in smoking. A new study finds that while death rates from cancer varied between men and women and among countries, they generally improved in all major European nations. The study, published Monday in the Annals of Oncology, found that in the 27 European Union countries, overall cancer mortality declined 9% in men and 8% in women in the period 2000-2004 compared with 1990-1994. That translates to the cancer death rate falling from 185.2 deaths per 100,000 men to 168, and from 104.8 to 96.9 for women. Middle-age people showed the largest drop. The researchers were led by Professor Carlo La Vecchia, head of the Department of Epidemiology at Mario Negri Institute in Milan, Italy, and Professor Fabio Levi, head of the Cancer Epidemiology Unit at the Institute of Social and Preventive Medicine, in Lausanne, Switzerland. They found that cancer deaths peaked in 1988 in the EU and have fallen steadily since then, largely thanks to a "changes in tobacco consumption" and alcohol use. For example, lung and other tobacco-related cancers in men fell 16%, together with the persistent drops in gastric cancer, and the recent appreciable decline in colorectal cancer. Women showed a persistent drop in cervical cancer, along with a recent fall-off in breast cancer mortality, particularly in Northern and Western Europe. But tobacco and alcohol weren't the only determinants. Dr. Cristina Bosetti, also at the Mario Negri Institute, says "Screening and early diagnosis have contributed to the decline in cervical and breast cancer, although the fall in breast cancer mortality is mainly due to improved treatment. Therapeutic advancements have also played a role in the reduced mortality from testicular cancer, Hodgkin lymphoma and leukemias, although the declines have been delayed and are smaller in Eastern Europe." The researchers say the picture is variable across Europe and between sexes. For instance, where alcohol or tobacco consumption, or a combination of the two, has increased (particularly in women), deaths are rising from cancers known to have these as risk factors, such as lung, mouth, pharynx and esophagus. The highest mortality rate in men was observed in Hungary with 255.2 per 100,000, compared to 136.9 in Switzerland. Similarly, for women, Denmark had the highest mortality rate of 141 per 100,000, compared to 80.9 in Portugal. The researchers say this reflects "the different spread of cigarette smoking among men and women across various European countries in the past. Thus, further reduction of tobacco smoking remains the key priority for cancer control in Europe." They also note that reduced alcohol consumption, better nutrition (including overweight and obesity) and more widespread screening, early diagnosis and therapeutic advancements for treatable cancers would further reduce European cancer rates. A Similar Trend in the U.S. In the U.S., death rates from cancer have been dropping as well, and it appears for the same reason, according to data from May published at CA: A Cancer Journal for Clinicians. During the 15-year study period, the cancer death rate among men dropped by 19.2%, mainly due to decreases in lung, prostate and colon cancer deaths. In women, the rate fell by 11.4%, largely due to a drop in breast and colorectal cancer deaths. 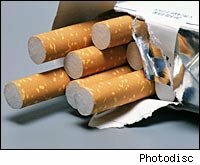 Similarly, the researchers found that the decrease in lung cancer death rates among men is due to reduced tobacco use during the past 50 years, while the drop in death rates for female breast and colorectal cancer largely reflects improvements in early detection and/or better treatment. However, the U.S. death rates from cancer still seem higher than for other Western nations. According to data from the Oganization for Economic Cooperation and Development, the U.S. ranked 15th in 2004 in cancer death rates among the 30 industrialized nations. In the U.S., too, the American Cancer Society says as much as half of the suffering and death from cancer could be prevented by more systematic efforts to reduce tobacco use, improve diet and physical activity, reduce obesity and expand the use of established screening tests.